"Baby, It's Cold Outside feat. Meghan Trainor"
001 Let It Snow! Let It Snow! Let It Snow! 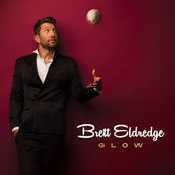 Glow es el nuevo disco del cantante de country Brett Eldredge que nos presenta sus 11 nuevas canciones Navideñas con canciones como 'The Christmas Song' o 'Let It Snow! Let It Snow! Let It Snow!' entre las mas conocidas.